We have an opportunity for a Maintenance Manager to join the company to ensure efficient running and effective management for the day-to-day running of the CNC and process equipment within our Manufacturing Facility. 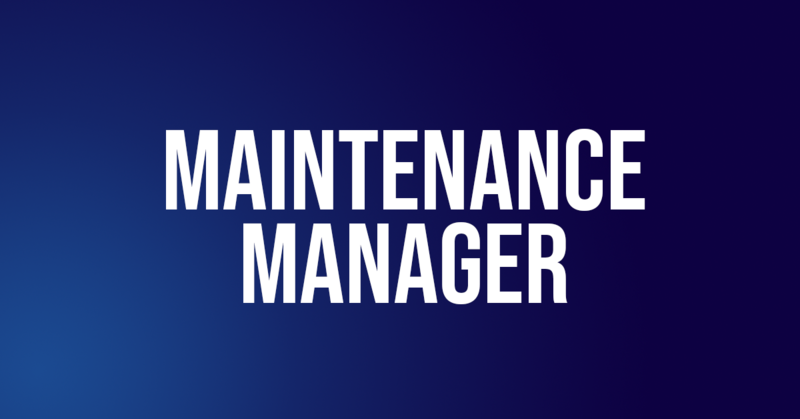 Leading the site Maintenance function in providing both a reactive and proactive, multi-skilled maintenance service on all operational equipment and facilities infrastructure. Increase the site operational effectiveness, improve on project delivery, improve time between failure and downtime reduction, manage and implement improvement plans, driving Key Performance Indicators (KPI’s) ensuring that Health, Safety and Environmental requirements are adhered to. Ensuring that the facilities, layout and machinery used to produce new and existing materials and goods run to their maximum efficiency and output. Total preventative maintenance, managing breakdowns of mechanical, electrical and robotic equipment (including software programming). You will report to the Production & Works Manager. Effectively delegate any maintenance issues to be resolved on each shift and small projects to the right skills in the team, planning and managing effective works. Develop a Planned Preventative Maintenance (PPM) schedule, ensure full preventative maintenance is carried out, plan in missed maintenance activities, and lead the team to deliver effectively. Ensure routine calibration and maintenance requirements of a variety of electro-mechanical, hydraulic and pneumatic systems are undertaken. Assist where required, the introduction of new machinery, plant and equipment from drawing up the specification, to managing suppliers through to full installation in collaboration with all relevant parties. Perform root cause analysis and resolve problem. Arranging specialist procurement of fixtures, fittings or components. Controlling maintenance tools, stores and equipment and ensuring accurate stock records maintained. Identify and deploy the technical skill sets, resource levels and systems to deliver projects, including the engagement of external resources as required. Develop, implement and manage key performance indicators (KPIs) for each area of responsibility. Ensure KPIs are met by working to the overall plan, including management of, and reporting. Manage, coach and develop a high performing Maintenance Team that meets agreed objectives, and which delivers best practice results, added value and continuous improvements. Develop and maintain strong relationships with internal and external stakeholders to ensure optimal performance. Support, comply and ensure complicity with Health & Safety regulations, the Company Handbook, Quality and Environmental standards, and all other Company policies and procedures. Monitoring and controlling maintenance costs. Make sure risk assessments are carried out individually and departmentally. Excellent leadership and man management skills. An ability to work well under pressure as well as demonstrating excellent organisation skills at all times. Good verbal and written communication skills along with a hands-on approach attitude. Relevant manufacturing/engineering degree is preferred, or HND, BTec Professional Level 5 Award or equivalent NVQ Level 5 qualification. Extensive plant level experience with significant proven man management experience. Completed a fully indentured apprenticeship with a mechanical/ electrical / electronic discipline. Understanding of manufacturing and procurement/ supply chain. Understanding of TS1649, IOSH/NEBOSH, ISO 14001. Strong proficiency in Microsoft Office. Previous experience working with specialist equipment, such as CNC Saw, Drilling & Plasma Equipment. Working at heights / IPAF license. Overhead crane experience is essential. Shift working and overtime as required.